Time-slip novels are one of my favorite genres, so when presented with the opportunity to interview Nicola Cornick about House of Shadows, I quickly said yes. She's known for her well-researched historical romances, so her newest novel is a departure, and a very successful one. House of Shadows intertwines the stories of characters from three historical periods: Elizabeth Stuart, the "Winter Queen" of Bohemia, and her supporter/champion, William Craven, in the 17th century; Lavinia Flyte, a 19th-century courtesan; and a modern-day woman, Holly Ansell, desperate to locate her brother, Ben, after he suddenly goes missing. Connecting all three of these strands are Ashdown House, a Dutch-style country house in Oxfordshire, and two objects with dark magical powers, a pearl and a jewelled mirror. The historical details and the three intertwined storylines (it would be hard to pick a favorite) made for a rich reading experience, and there's a good amount of romance and unpredictable mystery to keep the pages turning. You can see an image of Ashdown on the novel's cover. How did you first get involved with volunteering and serving as a tour guide at Ashdown House? I had lived near Ashdown House for almost 10 years before I became involved with working as a tour guide there. I’d driven past the estate so many times and was intrigued by the little white house hidden away in the wood. I wondered about its history. But I was working full time and never seemed to be free when it was open. Then I gave up my day job to write and was looking around for some volunteering work to do. I saw an advertisement for guides to take visitors around Ashdown House and it seemed the perfect opportunity, almost as though it had been meant! I enjoyed visiting Ashdown and the countryside surrounding it via the novel. Do you have any favorite aspects of the house or grounds to explore, or to tell people about? Thank you, I am so glad that the book conveyed some of the beauty of the house and its landscape! There are so many things about Ashdown that I love to explore and to tell visitors about. The roof platform is magnificent and gives panoramic views of the surrounding countryside. It’s worth visiting for that view alone! The village of Ashdown is a hidden gem with Victorian Gothic-style stables and the original laundry and farmhouse. There’s so much to see in the woods as well including the old holloways, the sunken tracks along which the drovers used to take their animals up to graze on the high Downs. It’s an ancient and mysterious landscape. One of your characters comments that the Winter Queen isn’t well-known in Britain, despite being James I’s daughter. Why do you think this is? I think that Elizabeth of Bohemia isn’t well known in Britain probably because she spent so little of her life here. In Germany and Holland, where she lived for over 40 years, she is famous and there are all sorts of legends about her. Although she was a prominent figure in European culture and politics in the early 17th century it was seen as peripheral to what was happening in England. Plus she was a woman and to a certain extent I think her role has been written out of history. The dedication to House of Shadows mentions your obsession with Ashdown and with William Craven. What about his life and character impresses you the most? It is William Craven’s unswerving loyalty and honour that impresses me the most, I think. At a time when many men changed allegiance depending on the political situation he was utterly steadfast in his devotion to the Stuart cause. I admire that sort of integrity. Did you have the opportunity to do research on site in Europe, in the places where Elizabeth Stuart and her husband once lived? Yes! One of the most exciting things about writing the book was the research and the fact that I was able to visit both Heidelberg, where Elizabeth and Frederick lived when they were first married, and also The Hague. Although the Wassenaer Hof in The Hague is no longer standing it was possible to visit some houses of a similar era to get a real feel for the style of architecture and the interiors. I also found online a virtual recreation of Elizabeth and Frederick’s hunting lodge at Rhenen, which was fabulous! The two items which come to have dark powers, the Sistrin pearl and the Italian jewelled mirror – I’m assuming that both are fictional, but are they based on any real items, or on some aspect of Rosicrucian symbolism (or both)? The mirror was a completely fictional creation but the Sistrin pearl is based on a real jewel. One day a jewellery specialist came to Ashdown to look at the pearls that feature in some of the portraits. She identified one particularly fine drop pearl as being in the Royal Collection and told me that Elizabeth of Bohemia had inherited it from her grandmother, Mary Queen of Scots. It is called the Bretherin and is said to be cursed. She also told me some other wonderful stories about the jewellery in the portraits. It was a gift for an author! I did a lot of research into 17th century Rosicrucianism for the story as well since Elizabeth, Frederick and William Craven were all said to have been involved with the Knights of the Rosy Cross. Curiously, though, it is Ashdown House itself that bears the most striking resemblance to Rosicrucian symbolism. The cupola on the roof looks exactly like images of the “invisible Rosicrucian College” dating from the early 17th century. The story of early 19th-century courtesan Lavinia Flyte felt very real (I even googled her name to see if she’d been an actual person!). Did anyone inspire her story? 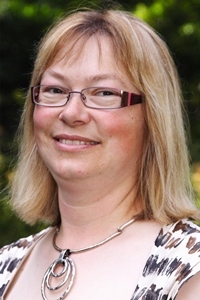 Lavinia’s story came from another aspect of Craven family history. The first Earl of Craven of the Second Creation was the first lover of the notorious Regency courtesan Hariette Wilson, who gave him a pretty scathing write up in her memoirs. That was the seed for the idea of Lavinia and her diary. Jane Austen, a relative by marriage of the Earl, disapproved of the fact that Craven’s charm hid a want of moral character. She is said to have based the character of Willoughby in Sense and Sensibility on him. Structuring this novel must have been incredibly complex! Had you planned from the beginning to include three time-period strands, rather than the more usual two? I’m not a planner when I write so I didn’t set out to write three time period strands, rather they evolved as I went along. 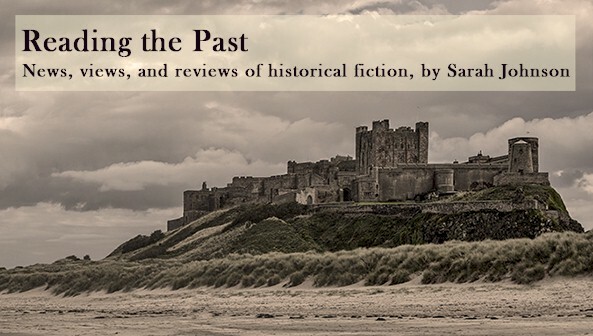 I began with the intention of writing Elizabeth and William’s story and I thought I would need a contemporary strand as well in which to unravel the historical mystery. Then Lavinia popped up and was very real to me, hence the first person sections from her memoirs. That said, I did find the structure hugely complex and am only writing a dual timeline for my next book! What about the time-slip genre appeals to you? Do you have any favorite time-slips that inspired your own writing? I have always loved the timeslip genre and can trace the appeal back to when I first started reading it as a teenager: A Traveller in Time by Alison Uttley and Astercote by Penelope Lively were my childhood favourites, leading to Green Darkness and The House on the Strand. These days I particularly love Susanna Kearsley’s fabulous time slip novels and anything by Barbara Erskine, the Queen of the genre! 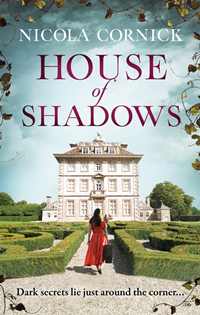 House of Shadows was published by Harlequin MIRA UK this month (£7.99, paperback, 476pp). UK and international readers (US included) can obtain copies at Book Depository. For more information, visit the author's website at http://nicolacornick.co.uk; she's also a contributor to the popular Word Wenches blog. Pleased you enjoyed it, and thanks for commenting! Thanks for the post. What a wonderful way to spend one's time, researching, planning, and writing a book like this. Looking forward to reading it. Happy Thanksgiving! I'd love to visit Ashdown one day and spend some time walking around the grounds myself! Very challenging to write three time periods. I'm so looking forward to reading this book. Hope you'll enjoy it too. It was put together very well. I can't think of many timeslips that involve three time periods. Lovely interview with a superb author. I shall be reading. I adore Time Slip novels for the reason that we can get a modern look at historical events or atmospheres as well as the atmosphere of that past time. Same here, Carol. Plus I like the idea that it's possible to somehow connect to people living in an earlier time. The Winter Queen . . . sad and fascinating story. And I hadn't heard of William Craven before this... shame on me. Thank you fora great interview, it is always so nice to read what goes on through the authors head when writing or researching to write.